Black & White Gala – Celebrating 15 Years! 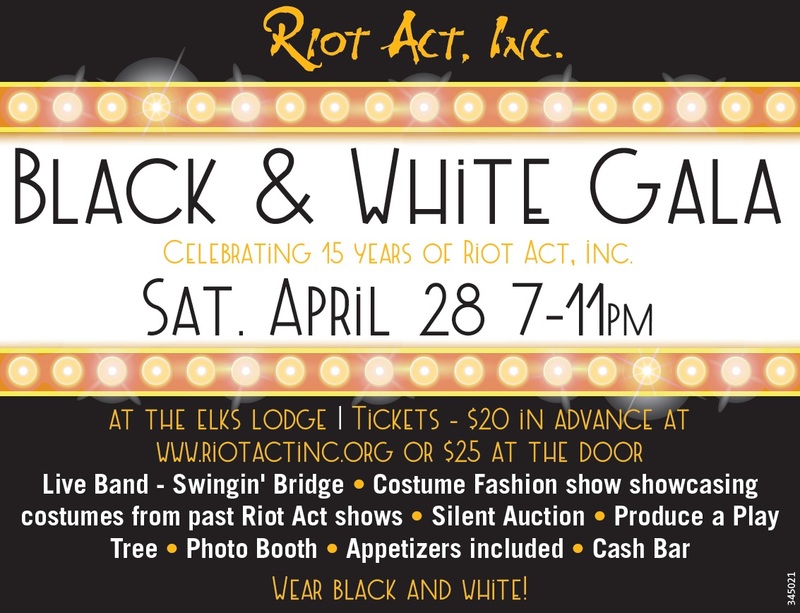 – Riot Act, Inc.
Jackson, WY – Riot Act will be celebrating our 15th anniversary season with a Black & White Gala on Saturday, April 28 at The Elks Lodge from 7:00pm-11pm. Please celebrate with us. 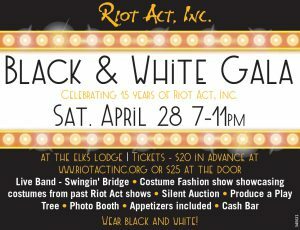 Join us for a Black & White Gala to celebrate 15 years of Riot Act, Inc. Tickets are $20 in advance at www.riotactinc.org or $25 at the door. Fun to be had by all. We encourage guests to dress in Black & White. There will be a live band all night – Swingin’ Bridge. Enjoy included appetizers. Reminisce about past Riot Act performances with our Costume Fashion show featuring costumes from past productions worn by the original actors. There will be a silent auction with great prizes. Help us with our Produce a Play Giving Tree. And bring home a souvenir from our photo booth. Mission Statement: We are a theatre of community consciousness and artistic accountability. We are a fluid collective of artists who provide a place to explore collaboratively, make our own artistic decisions, take risks, start a riot! Since 2002, Riot Act, Inc. has provided provocative, community conscience theatre to Teton County. Mike Bressler of JH Weekly once wrote in a review of The Annual Series of Shorts, “Riot Act is to be commended on making these and other plays available to the public for a reasonable cost.” To continue to fulfill our mission of bringing affordable, challenging productions to Teton County stages, we ask our adoring public to join us in celebration. If you cannot attend this event, but still want to donate, you can send your tax deductible donation to: Riot Act Inc., P.O. Box 6735, Jackson, WY 83002.